One of the most beautiful enclosures you can find with a curved 3/8" plexi face and constructed out of 3/4" industrial grade MDF (medium density fiberboard). 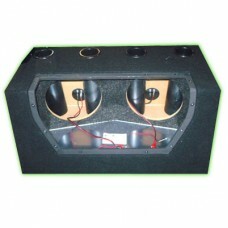 Mirrored inside to make the entire woofer visible through the plexi face. Brushed aluminum sides....Very Cool! All stapled, glued and chalked for absolutely no leaks or rattles....Very important! Dimensions: 28"W x 14.5"H x 17"D - Mounding depth: 6"